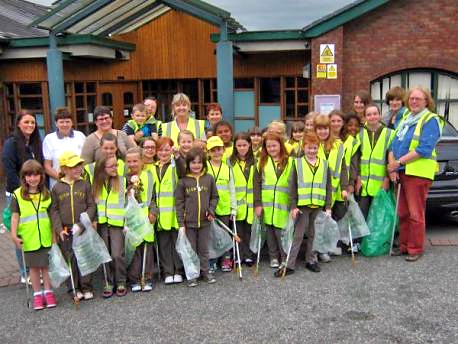 The last litter pick of 2014 took place on Saturday 13th December when we met at the Town Bridge car park. The weather was perfect for a walk around our town. Thirteen members joined us including Fiona Bruce MP and her husband. 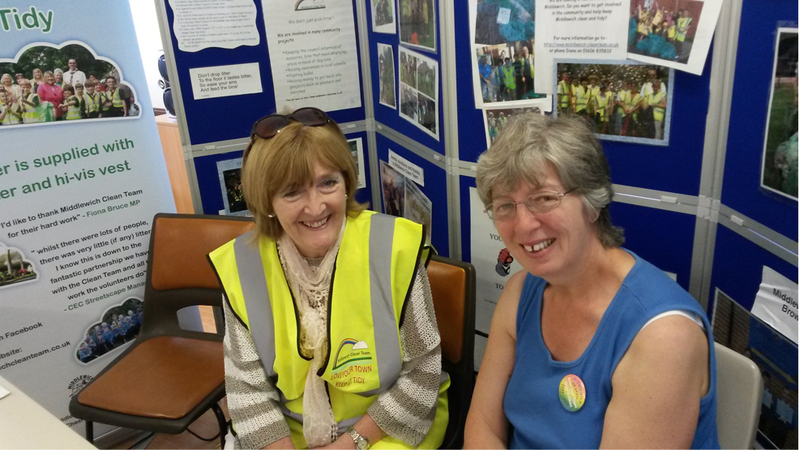 Fiona has been a member of Middlewich Clean Team for many years and it is always delightful to welcome her when her busy schedule allows. The Boars Head kindly provided tea, coffee and biscuits for us afterwards. So one hour amounted to thirteen man hours were worked on Saturday and we feel this kind of effort is making a considerable difference to the overall tidiness of our town. Added to that we met up with friends, chatted and had fun. We are always looking for new members who can commit to looking after their street or around their home. Middlewich Clean Team supply the necessary equipment. So if you have a little spare time why not give me a ring 01606836263 and join our very vibrant group, either on organised litter picks or just by looking after an area near to where you live. Our website is full of details concerning dates and other interesting information. Approximately 5 tonnes of smoking-related litter: cigarette stubs, matchsticks and packets are discarded every day in the UK. Middlewich Clean Team has joined forces with Japan Tobacco International UK (JTI) a leading tobacco manufacturer, The Campaign to protect Rural England (CPRE) and Liz McGuinness of Middlewich Pubwatch in a bid to reduce cigarette litter in the town. As a result 34 cigarette stub bins have now been installed outside pubs and other businesses in Middlewich as part of a pilot study. JTI has funded the wall-mounted bins which have been installed outside pubs following talks with Liz McGuiness, chair of the Pubwatch scheme. As part of Stop the Drop, the national anti-litter campaign. CPRE and JTI, who have centres in Cheshire, chose Middlewich to pilot the scheme. On Saturday 3rd May, nine members of Middlewich Clean Team showed by their actions how in less than an hour they can make a difference when it comes to keeping our town clean and tidy. An overgrown area at the side of former PACE Centre on Wheelock Street had become an eyesore right in the town centre that had been noticed by several members and they were determined to do something about it. So, armed with spades, rakes, loppers and brushes they worked hard and, as you can see from the before and after pictures, transformed the area. Looks a lot better. Photo: Bernice Walmsley. The team at work. Photo: Bernice Walmsley. Middlewich Clean Team visited nurseries and a residential care home to share their work with younger and older generations. Chairperson of the Clean Team, Janet Chisholm and committee member, Hilary Jones, made their annual visits to the town’s nurseries in March.The team talked to the children at Playbox Community Centre, Peter Pan, Rainbow Day Nursery, Early Learners Nursery and Tommy Thumbs.about the importance of putting litter bins and the role of Middlewich Clean Team. One or two residents of the home have already been seen out and about picking litter, which proves that everyone, young or old, can do their bit to keep our town clean and tidy. Nothing like an untidy mess giving Middlewich such a poor image to get the Clean Team going! There was a problem though; how to get to the patch of land which is between the canal and the River Croco? Middlewich Narrowboats to the rescue! After checking health and safety procedures the Middlewich Clean Team volunteers gratefully accepted the offer of a lift to the scene from Middlewich Narrowboats. They easily disembarked and commenced work straight away. Twenty minutes later and it was a good job done with the view for canal users and pedestrians alike very much improved. Importantly the image of Middlewich as a clean and tidy place to be was improved too.